What Pool Accessories and Options Should I Consider? 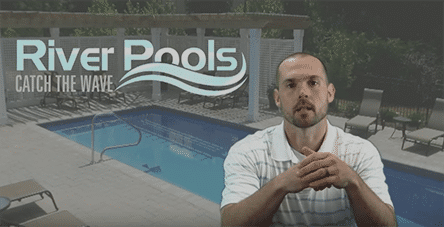 Avoiding 4 Common Fiberglass Pool Installation Problems! "Pool option" is a very broad term. Let's see if we can narrow it down a bit. Then there is an entirely different set of options regarding the pool patio and coping that outlines the pool. We won't go into that here, but we'll cover everything else. Let's take a look at each pool option, its pros and cons, and how much it costs. We always recommend colored pool finishes because they not only make the pool more attractive, but they're also more durable and stain-resistant than the standard white gelcoat. Most manufacturers offer at least five choices for a pool cover. This typically includes a variety of blues, a tan, a black, and sometimes a grey. The most important factor when selecting a color is the way it is applied. Most manufacturers use colors that are applied in a single application. This makes a repair, if necessary, easier to accomplish. Avoid manufacturers who apply colored finishes in multiple layers. You can find this information from each manufacturer. Most dealers include the cost of colored finishes in their base package prices. However, if there is an upcharge, it is typically $1,500–$3,000. It's also important to note that the availability of certain colors may be limited, based on what pools are available. 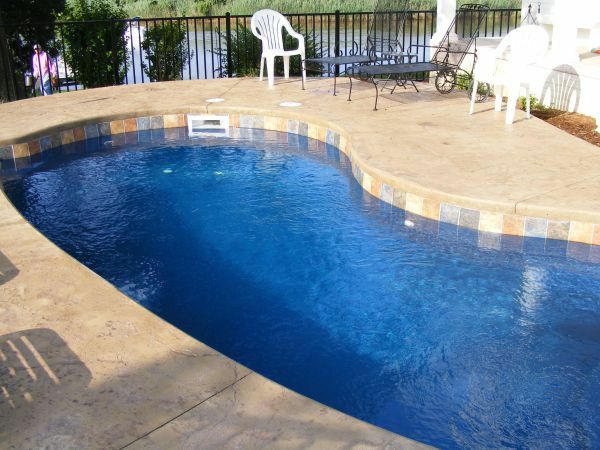 Has Blue Become the Color of the Fiberglass Pool Industry? Concrete, Vinyl, and Fiberglass Pool Fading: Which Fades Worst? You might have heard someone refer to a "salt water pool." It doesn't mean they swim in the ocean! They're using a salt chlorine generator. Instead of adding big buckets of chlorine to the pool water, you add salt, and the generator converts that to chlorine. What you get as a result is great water quality without the harsh side effects typically associated with chlorine pools, like burning eyes and strong odors. Simply maintain the proper salt level in your pool. Test your chlorine levels on a regular basis, add salt directly to the water when necessary, and enjoy. Salt water chlorinators, in our opinion, are a no-brainer. They typically cost between $1,700 and $2,500. Ever seen what salt does to a concrete sidewalk? It does the same thing to the surface of concrete pools. But don’t worry, salt has no adverse effects on the surface of a fiberglass pool. Should I Get a Salt Water System in my Pool? How Long Should Salt Water Chlorinators Last? What Type of Salt Should I Use and Why? The vast majority of lights installed in fiberglass pools today are low-voltage lights like the Pal 2000. As one of the first in the industry to embrace this product, we have found it to illuminate the pool well and stand the test of time. Colored LED bulbs allow you to change colors with the simple flip of the light switch. These lights come encased with a cord long enough to extend above the water level so the bulb can be changed easily without lowering the water level in the pool. These lights typically cost between $700 and $900 installed. LED vs. Fiber Optic Pool Lights: Which is Better? Most pool packages come with at least a standard tarp cover, but the majority of pool owners will upgrade to a security cover for their long-term needs. These covers are strictly used to cover the pool when closed during the winter. They look sort of like a trampoline, with spring-loaded straps that anchor into the concrete. They provide safety, they look far better than tarp style covers, and they are extremely low maintenance. Security covers typically cost $1,800–$2,700 installed. Automatic covers come in many forms, and this is the reason for their broad price range of between $12,000 and $22,000. Auto covers typically do well at keeping out debris, keeping the pool water warm, and protecting the pool against unwanted guests/swimmers. The downside, however, is that the cover fabric will typically last between 5 and 8 years at a replacement cost of $4,000 to $6,000. Plus, auto covers slide in a track that runs the length of the pool. Freeform pool shapes require the tracks to be installed on top of the patio, which is very unsightly. Consequently, most folks feel limited to a rectangular-shaped pools, which allow the tracks to be hidden under the pool coping. Finally, the biggest issue with automatic covers is their propensity to break down. If this happens with the cover closed, no one's swimming that day. 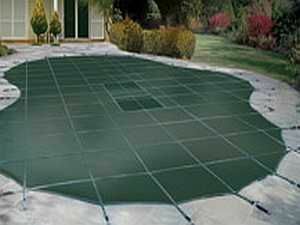 So, are automatic pool covers worth the investment? We feel that in most cases, it’s very difficult to justify the expense, especially considering their incompatibility with salt chlorinators because of corrosion issues. However, even though they are in the minority, there are certainly situations where auto covers can and should be used. Solar covers work exceptionally well for one thing: extending the swim season. They simply retain the heat during the night that the pool absorbed during the day. On average, the use of a solar cover will extend your swimming season 2–3 weeks on each end. That's about 4–6 weeks altogether. So why doesn’t everyone use solar covers? Because they’re cumbersome to work with. Reel systems are the best way to remove and re-install the cover, but they span the width of the pool and take up a ton of space. One common misconception about solar covers is that they are effective at keeping debris out of the pool...not so. Sure, the stuff does collect on top of the cover, but you still have to take the time to remove it or it all ends up in the pool anyway. It’s just as fast to vacuum the pool. A solar cover typically costs between $100 and $250, and the reel system $350–$600. Solid vs. Mesh Security Covers: Which Is Better? 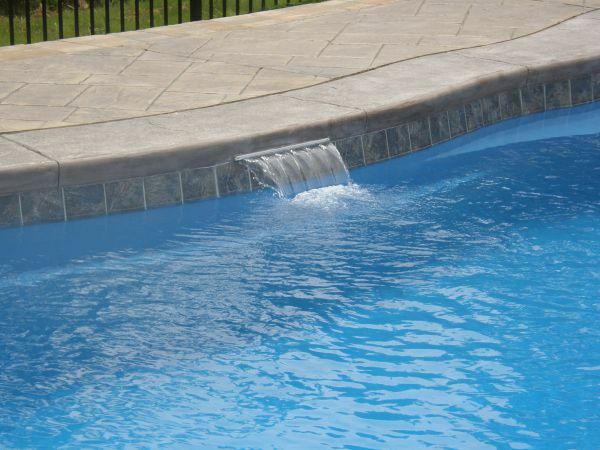 Waterline (or perimeter) tile on a fiberglass pool is actual ceramic or glass tile adhered to the surface of the pool with a specially formulated silicone product. The tile is grouted with a silicone product as well, allowing the tile to flex and move with the pool shell. 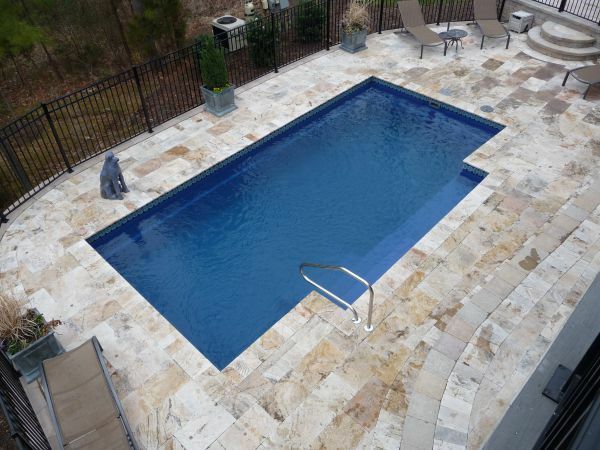 The number of tiled fiberglass pools has decreased with the advent of colored pool finishes. However, the main benefit of tile continues to be its aesthetic appearance. It can accent the waterline very nicely and make the perfect transition between pool and deck. 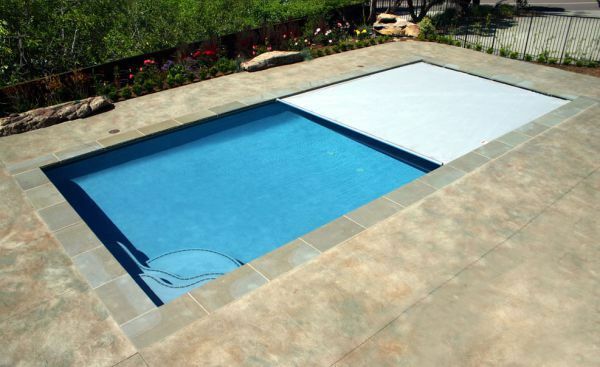 Unlike a concrete pool, a fiberglass pool doesn't need waterline tile to keep the waterline free of staining. It's merely for aesthetics. With a price tag of $2,700–$3,200, it isn’t cheap. Another drawback is that waterline tile will eventually break down and/or fall off, usually within 7–10 years and at a higher cost of replacement, usually between $3,500 and $4,000. The design of a water feature is only limited by two things: imagination and budget. In most cases, less is more. Often times, the audible sound of falling water in the environment is just as important as the visual impact. There are many simple ways to integrate water features into a design, but the most popular is a cascade waterfall that spills a sheet of water from the coping of the pool. These are typically 18 inches wide and cost around $1,000. Some more elaborate water features are elevated poolside walls with spillways, scuppers, sconces, or spouts, natural water features integrating real or artificial stone, and deck jets that launch a stream of water from the patio into the pool. 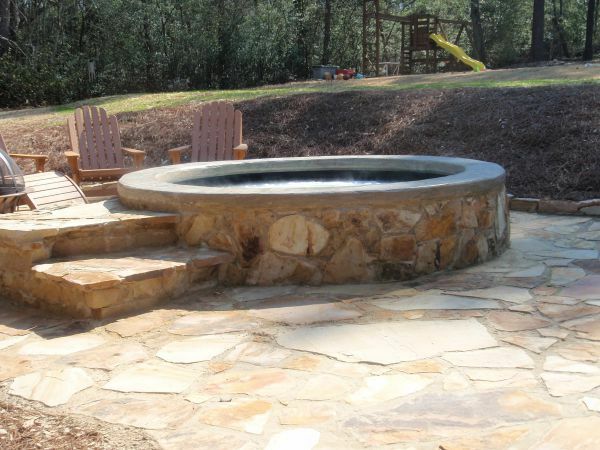 Custom water features can range anywhere from $2,500 to $25,000. If you think you might add a water feature in the future, have the contractor run a plumbing line for future use. This usually costs around $350 and will make installing the future water feature much easier. Can Any Fiberglass Pool Have a Tanning Ledge and Custom Water Feature? We’ll keep this one short and sweet. In terms of performance, above ground spas blow inground spas out of the water in every category: jetting, seating, efficiency, etc. They're also a fraction of the cost. The average above ground spa costs between $6k and $10k. The average inground spa costs between $15k and $30k, so it becomes very hard to justify the cost of an inground hot tub unless it's used for its aesthetic value. When incorporated properly into a design, inground spas can serve as a gorgeous water feature by implementing spill ways, lighting, and other features. In our opinon, this is how they are best used. Inground Hot Tubs vs. Above Ground Hot Tubs: Which is Better? The number of automatic vacuums available on the market has increased exponentially just in the last five years. Where there were once only about 3 or 4 options, now there are about 50. 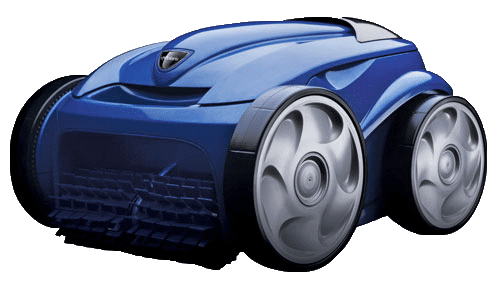 Automatic vacuums range in price from about $400–$2,500, and vary in their effectiveness as well. We tend to gravitate toward the robotic cleaners because they are a stand-alone unit and don't require additional plumbing or booster pumps, which can fail over time. Because they can be added later, we typically suggest not getting an automatic cleaner with a new pool. Fiberglass pools are so easy to maintain, most find it unnecessary. As a general rule, pool heaters are only used during the beginning and ends of the swim season, adding about a month of swim time to each. These heaters burn natural fuel to heat the water. They do require hookup to a fuel source as well as electricity to operate. They typically cost $3,000–$4,000 initially. On top of that, gas and electrical hookup often cost at least $1,000. They can cost $300–$800/month to operate. Swimming pool heat pumps work on the same principle as heat pumps for a home. They condense the heat from the outside air to heat the water. They require electrical hook-up. Because of the amp draw of the units, this will cost more to wire than natural gas/propane heaters. Heat pumps typically cost between $4,000–$6,500 initially and then $50–$250/month to operate. We find that about 19 of 20 of our customers who install heaters choose heat pumps simply because of their dependability and low operating cost. On the other hand, go with the lp/ng heater if you want absolute control of your pool temperature year round with no concern of fuel cost. 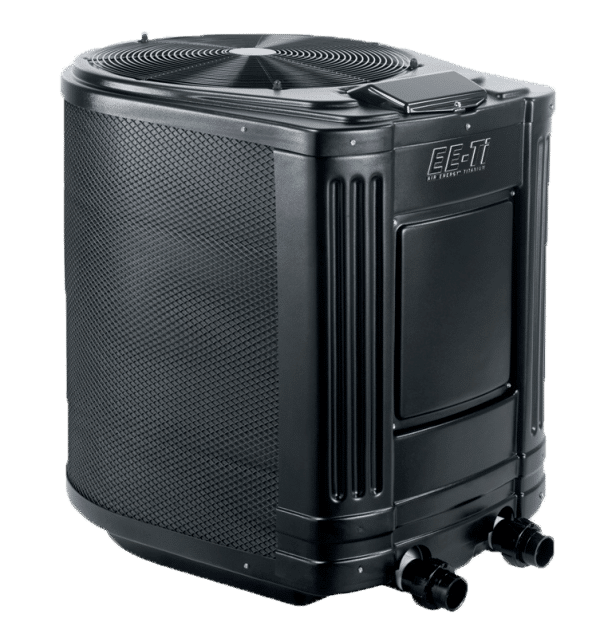 If you’re looking to extend your swim season at the lowest cost, a heat pump is probably for you. 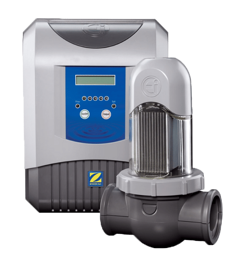 Various components of your pool require wiring, such as the pool pump, light, salt system, heater, etc. The price for this work varies depending on certain factors such as the location of the pump and filter system, whether there is a heat pump, spa, or other component needing to be wired, and whether the home has a crawl space or basement. A basic electrical hook-up package would typically cost between $2,750 and 3,250. This price would be for a project where the pump and filter system are located at the house, therefore not requiring trenching to run power to the equipment, a house with a crawlspace (not a basement), and hooking up a basic pump, salt system, and pool light. Homes with basements typically cost an additional $750, adding a heat pump typically adds $1,000, and trenching into the yard typically adds $500–$1,500 depending on the amount of trenching and wire size. 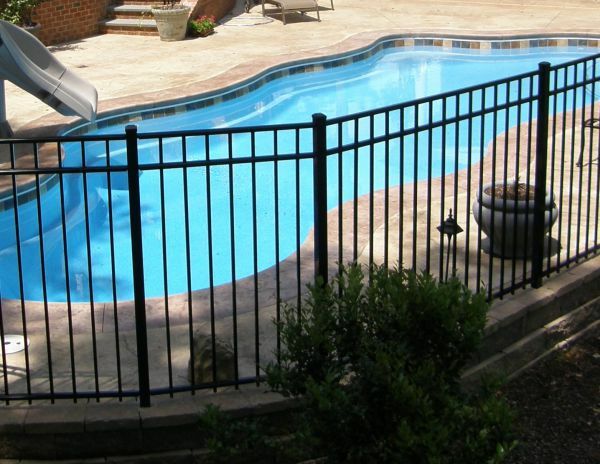 The most popular pool fence on the market today is made of powder-coated aluminum. This sleek, low-maintenance product is perfect for pool projects that don't require a privacy fence. The typical color is black, but white, green, and copper colors are also available. Aluminum fence typically costs around $30–$45 per linear foot. PVC fence is also a viable option around pools, especially when a 6-foot-tall or higher fence is needed. It is also relatively low maintenance and durable. PVC privacy fence typically costs between $35 and $55 per linear foot. Wooden and chain link fence are by far the most budget-friendly options. Wood requires much more maintenance than aluminum or PVC. With chain link fence, be sure to check your local fence codes because the standard-size diamond openings do not pass in most areas. Wooden and chain link fence can cost between $20 and $30 per linear foot. Will Your Pool Fence Pass Code? A lot to consider, huh? Those three greatly impact your pool experience. Many of the other options such as heaters, automatic cleaners, and fancy water features can be added later. It may be beneficial to consider which options you can and cannot add in the future. If you'd like, you can learn more about pool patio and coping options. Editor's note: This page was updated on February 25, 2019.